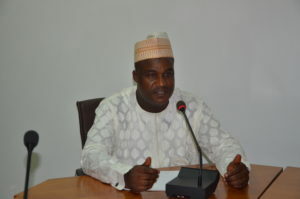 The Secretary to the Independent Corrupt Practices and Other Related Offences Commission (ICPC), Dr. Musa Usman Abubakar, has said that Anti Corruption and Transparency Units (ACTUs) are intended to complement the managements of Ministries, Departments and Agencies (MDAs) especially in mainstreaming a positive anti-corruption culture where they are lacking. Dr. Abubakar was represented by Mr. Justin Kuatsea, an Assistant Commissioner in the Corruption Monitoring and Evaluation Department (CMED) of the Commission at the inauguration ceremony of Anti-Corruption and Transparency Unit (ACTU) of Federal Ministry of Mines and Steel Development which took place in the Conference Room of the headquarters of the ministry in Abuja recently. In his welcome address, the Permanent Secretary of the Ministry, Dr. Abubakar Mu’azu, congratulated the new ACTU members on their appointment and cautioned them against using their position for personal benefits. He advised them ‘’to hold strongly to the tenets of the Unit’s Standing Order, which contains the rules guiding the operations of ACTU, as well as the Public Service Rules and other extant circulars or regulations as may be issued from time to time in the discharge of this crucial assignment”. Dr. Mu’azu promised to fully support the Unit in the discharge of its mandate. In his remarks, the immediate past acting Chairman of the Unit, Engr. Kehinde Oluboseye urged the ACTU members to see their appointment as a call to service having gone through the vetting process of ICPC. In his acceptance speech, the new ACTU Chairman, Alhaji A. T. Umar, prayed for God’s guidance in the discharge of the task ahead. He expressed his gratitude to the management of the Ministry for finding them worthy to serve in such capacity.